AVX Corporation has a new 0805-case BP Series multilayer, ITF band-pass filters. Created for broad compatibility with a wide range of high-frequency wireless applications, including satellite TV receivers, GPS, mobile communications systems, vehicle-locating systems, and wireless LANs, the series is offered in five frequency bands spanning 1,308MHz to 4,320MHz with 50Ohm characteristic impedance, and is rated for 5W continuous power, and operating temperatures spanning -40C to +85C. 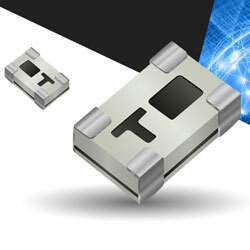 The new filters also show low insertion loss and sharp roll-off, providing excellent high-frequency performance in an ultraminiature, low-profile case which measures only 2.03mm x 1.55mm x 0.8mm (±0.1mm), and are ruggedly constructed and packaged on tape and reel for reliable automatic assembly.